Summon: Deal 6 damage to a random enemy. Beyte Fyr is a unique legendary Intelligence creature card. It cannot be obtained as part of your collection, but is summoned by Divayth Fyr. "If they were smart they'd run. Lucky for us." "They are like an annoying sand flea." Enemies include creatures your opponent's control as well as your opponent's health. Aside from card name and audio, Beyte is identical to her "sisters" Alfe Fyr, Delte Fyr, and Uupse Fyr. 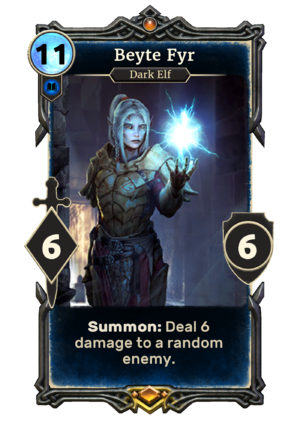 Beyte and her "sisters" are female clones of Divayth Fyr whose names are alphabetical identifications, and first appeared in Morrowind. This page was last modified on 16 February 2019, at 15:59.